Many people ignorant of Islam have misconceived notions about the Allah, used by Muslims to denote God. Allah is the proper name for God in Arabic, just as "Elah", or often "Elohim", is the proper name for God in Aramaic mentioned in the Old Testament. 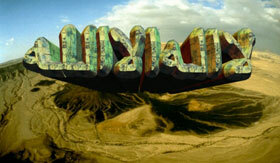 Allah is also His personal name in Islam, as "YHWH" is His personal name in Judaism. However, rather than the specific Hebrew denotation of "YHWH" as "He Who Is", in Arabic Allah denotes the aspect of being “The One True Deity worthy of all worship”. Arabic speaking Jews and Christians also refer to the Supreme Being as Allah. But by a mere verbal profession alone, one does not become a complete Muslim. To become a complete Muslim one has to fully carry out in practice the instruction given by Prophet Muhammad as ordained by God. This brings us to the second part of the testimony. Muhammad was born in Mecca in Arabia in the year 570 CE. His ancestry goes back to Ishmael, a son of Prophet Abraham. The second part of the confession of faith asserts that he is not only a prophet but also a messenger of God, a higher role also played by Moses and Jesus before him. Like all prophets before him, he was a human being, but chosen by God to convey His message to all humanity rather than one tribe or nation from among the many that exist. For Muslims, Muhammad brought the last and final revelation. In accepting Muhammad as the “last of the prophets,” they believe that his prophecy confirms and completes all of the revealed messages, beginning with that of Adam. In addition, Muhammad serves as the preeminent role model through his life example. The believer’s effort to follow Muhammad’s example reflects the emphasis of Islam on practice and action.